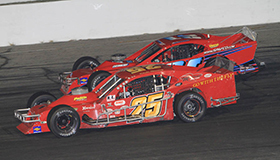 Excitement and anticipation for the beginning of the Valenti Modified Racing Series season will be at an all-time high when the series kicks off their 2014 campaign this upcoming weekend, March 29-30, at Waterford Speedbowl (CT). A new group of talent, proven talent at that, makes their way to the series this season making this year’s roster one of the most talented, star-studded groups this series has seen in 11 years of competition. The group of drivers competing this season, which includes current and former NASCAR Whelen Modified Tour drivers, will all be looking to knock off 2013 series champion Rowan Pennink and his Gary Casella-owned No. 25 team. During the 2013 campaign, Pennink and his team showed consistency throughout the entire season en route to his first touring series championship. The Huntingdon Valley, Pennsylvania driver, who will once again pursue the series championship in 2014, is excited about beginning his title defense at Waterford this weekend against a talented field of drivers and teams. One of the newcomers to the tour in 2014 will be NASCAR Whelen Modified Tour driver Justin Bonsignore. Earlier this year, the Long Island-based driver announced his intentions to run the full VMRS schedule in the Art Barry owned No. 21, which was driven to the 2012 series championship by Jon McKennedy. With a talented driver behind the wheel and a team that has proven they know how to win, the Bonsignore team is expected to be one of the favorites to win races and compete for the championship this season. “Being with a championship caliber team, I think we have to go into it thinking we can win the championship if all goes our way,” Bonsignore said. “It’s definitely going to be tough. The MRS has a lot of really, really good cars. It’s stiff competition, so it’s going to be a challenge. Hopefully, we can contend right off the bat. I’m pretty excited and I have a pretty good feeling we should be able to contend each and every week. Another former NASCAR Whelen Modified Tour driver, 2003 NWMT champion Todd Szegedy, will also make his way to the Valenti Modified Racing Series in 2014. Szegedy, last year’s winner of the NWMT event at New Hampshire Motor Speedway, will compete full-time this season in the Kevin Stuart-owned Modified previously driven by Louie Mechalides. In addition to the new talent making their way to the series in 2014, a number of series regulars, including 2013 feature winner Richard Savary and two-time series champion Chris Pasteryak, hope to make their bid for a title this season. A three-time VMRS winner in 2013, Steve Masse, is another driver that is gaining attention among drivers as a threat to win anytime he shows up to a Valenti Modified Racing Series event. Without a race in the books, Masse has already gained the respect of newcomer Justin Bonsignore. When told about Bonsignore’s comment, Masse looked at it as a huge compliment. He hopes to continue being in the minds of other drivers as a threat to win every week. The Bellingham, Massachusetts driver is unsure of whether he’ll compete full-time with VMRS this season, but hopes to once again stockpile wins at the races he does show up for. “It depends on how much money we’ve got,” Masse told Speed51.com when asked if he plans to run the full VMRS schedule. “The finances are tough. It’s tough to predict what you’re going to do in racing with the economy and everything like that. I really won’t make that decision until at least halfway through the season. VMRS officials have announced that 33 teams are pre-registered for tires at the season opening event at Waterford Speedbowl. The amount of teams competing in VMRS events have dramatically increased throughout the past few seasons resulting in some of the strongest car counts for a touring series in the Northeast region. In 2014, veteran Modified Racing Series driver Chris Pasteryak will look to join Kirk Alexander and Jon McKennedy as the only three-time series champions. Pasteryak, the 2008 and 2011 VMRS champion, ended 2013 fifth in the series standings after missing one start during the campaign. Drivers planning to compete for the 2014 VMRS championship will need to be able to perform well in the state of Connecticut this season. Eight of the 17 events on the schedule will take place at the three Connecticut ovals. 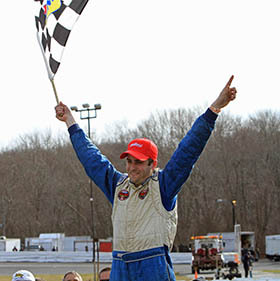 2013 series champion Rowan Pennink has four career VMRS victories in the state of Connecticut, while part-time VMRS competitor Keith Rocco holds a victory at each of the Connecticut tracks. Adjustment Period for NASCAR Whelen Modified Tour Drivers? One of the bigger questions heading into the 2014 VMRS campaign is whether or not guys like Justin Bonsignore and Todd Szegedy will be able to come right into the series and be championship contenders. There are a number of differences between the two touring series including qualifying procedures, live pit stops, and tire strategy. This will be something to look for when VMRS starts their season this weekend. Richard Savary was one of the hottest drivers over the latter part of the season in 2013. A strong run at Oxford Plains Speedway (ME) in July led to a stretch run that saw the veteran driver record his first career VMRS win at Thompson. Savary recorded eight top-five finishes and averaged a finish of 6.7 in 2013. If he can carry over the momentum that he had in 2013, Savary could be a legitimate threat to win the series championship.